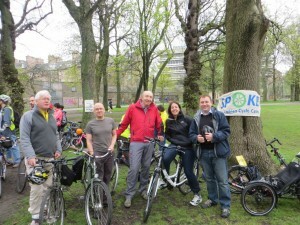 … even the politicians enjoyed it! It’s not all new cycling money! In fact, most is probably part of the ‘Sustainable and Active Travel‘ money already announced in last autumn’s budget, and Friday’s announcement is about how that money is to be spent. But some of it is new – we don’t yet know how much of it. The Minister is to be congratulated on persuading his colleagues in Education to put some funding into cycling, probably for the first time. Some is also from Climate Change – who already regularly fund local community cycling projects. The Cycle-Friendly College Campus sounds exciting. No details are given – presumably colleges will be asked to bid for this money? If so… college staff and students – make sure yours has a good case! On-road bike training for kids is welcome but, as many have pointed out, it’s the on-road cycling conditions and it’s the driver behaviour which are where the main emphasis needs to be. 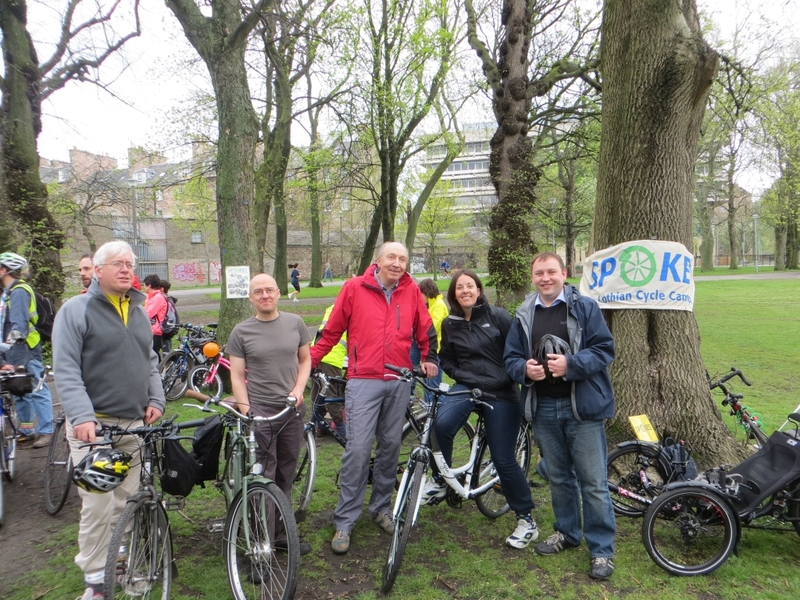 SPOKES (The Lothian Cycle Campaign) undertakes an annual survey which aims to identify total Scottish public sector investment in cycling. The figures produced by SPOKES are the most accurate and comprehensive guide to public investment in cycling in Scotland. The most recent figures can be found in SPOKES Bulletin 117 (SPOKES 2013). Our latest summary table is in Bulletin 118 and this will be updated in Bulletin 119 in late May/early June. Find them on our Bulletins page. Our survey (and the SPICe Bulletin) show clearly that unless plans change in this autumn’s budget, 14/15 will mark a peak in government cycling investment, after which it will start to fall back in 15/16. PoP2014 should mark the start of a campaign to ensure that the autumn’s budget will bring a substantial rise in investment, not a fall! It’s not too soon to raise this with your MSPs now. Public cycle counters are a great way to encourage cycling – it’s hard to resist a moment of excitement when you increase the number as you cycle past! 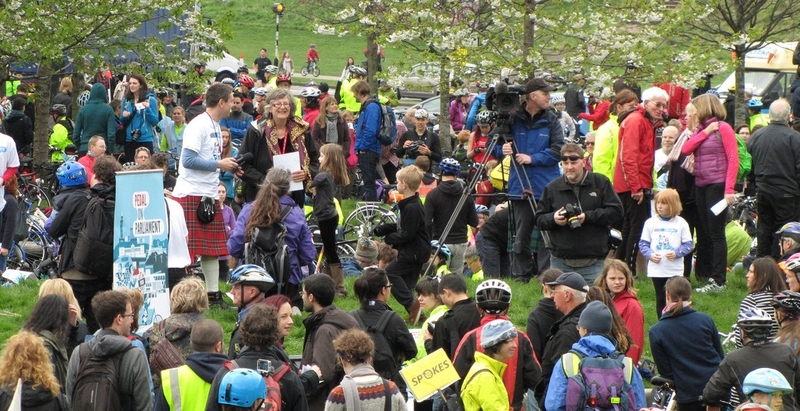 Spokes has consistently lobbied Edinburgh Council for a Middle Meadow Walk public counter, and it was agreed in ATAP, the Council’s Active Travel Action Plan. 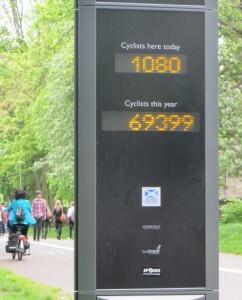 However this was overtaken when Sustrans won government Climate Change money to install 9 public counters around Scotland, including Middle Meadow Walk. In recognition of the Spokes role, our logo is on the MMW counter. The counters will be in Clydebank, Glasgow, Coatbridge, Stirling, Benderloch, Inverness, Perth, and Edinburgh (Meadows and Canal) with a Master Display outside the Scottish Government Offices showing all counts. Whilst the data will be useful, there are of course already many non-display counters, and we see the greatest value of the public counters in encouraging people to cycle. If your area doesn’t have a public bike counter, tell your MSPs about them, ask for a second batch of counters to be funded, and suggest your ideal local location. Also on Friday Cycle Law Scotland revealed data, obtained via Freedom of Information, showing that drivers were reported by Lothian and Borders police for prosecution in only 11% of collisions involving a motorist and a cyclist. Some cases involve serious injury and clear evidence that the driver is at fault, yet there is no prosecution. This adds to the need for presumed liability laws, whereby a vulnerable road user would automatically receive compensation in a crash with a vehicle (unless the driver could prove no fault) whether or not the case went on for criminal prosecution. This would also apply to a pedestrian in a crash with a cyclist. Presumed liability would shift the burden of proof from the more vulnerable (as it is currently) to the more powerful. Only days earlier, a new campaign group, RoadShare, was set up to take the campaign for Presumed Liability in Scotland to a new level. The group has a wide range of support (including a Spokes representative) and of technical, legal and political expert members. It is chaired by consultant surgeon Dr Chris Oliver, also a longstanding Spokes member. If you’ve not yet signed the petition for presumed liability, please do so here.